When it comes to searching on the Internet, where a particular search result appears in the list of results can make an enormous difference. Companies pay big bucks to SEM and SEO experts to tell them how they can be ranked higher for specific search keywords. While you cannot control all that happens to you on Google or Bing, when it comes to your own website, you have more control over which internal search results you choose to show to your visitors. In the past, I have shown several ways to track what is happening with your internal search, but in this post, I will explore a new internal search topic – how to see if placement matters. After reading this post you will be able to see how each search result placement performs and even be able to break it down by internal search term. However, as you can see, in this setup, it would be difficult to tell whether the visitor clicked on the first item in the list, the second, the third, etc.. Some of my customers want to know if it is worthwhile to have more than three or four search results at all. As you can see here, the visitor was presented with almost 38,000 search results, but how many went beyond the first five? Is less more? To answer this question, we need to tell SiteCatalyst which position the link that is clicked was in. 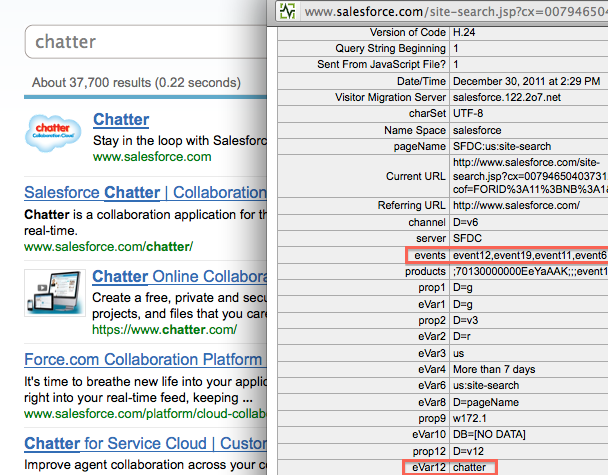 For example, if this visitor clicked on the second search result above (the one that goes to “www.salesforce.com/chatter”), that would be considered the second spot. What would be cool is if we could see how many Internal Searches contained a “Spot #2” and how many Internal Search Clicks took place for “Spot#2.” If we had that, we could use a Calculated Metric to see the conversion rate of each internal search result placement. In this fictitious example, we can see that the items with the top-most placement spot get clicked the most. However, the most interesting aspect of this report is that the first five internal search placement slots account for almost 60% of all search result clicks! If we use the 80/20 rule, we could probably get almost the same number of internal search result clicks by having seven results as if we had hundreds. If you are not using SiteCatalyst v15 yet and don’t have any eVars left for which you can add Full Subrelations, you can also concatenate the search term and the spot # into an eVar to see similar information as long as you don’t have too many internal search terms. For example, you might see a page like the one above and want to know if items in the top-left perform better than those in the middle. Doing this is easy if you leverage the concepts above. In this case, the “spots” we discussed are not vertical, but rather go left to right and row by row. You can come up with any spot labeling system that makes sense to your organization (i.e. row1-spot1, row1-spot2, etc…). 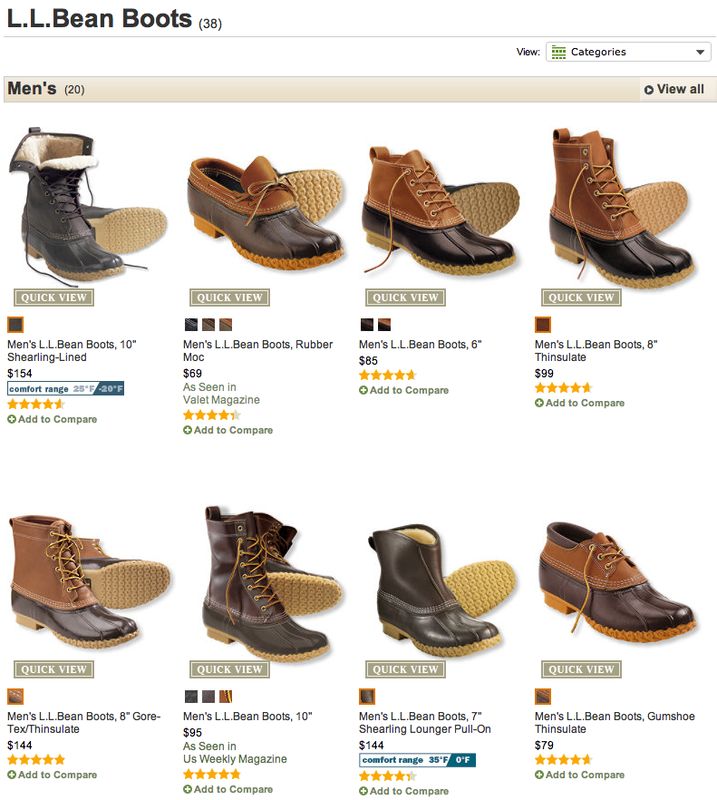 If internal search and/or product lists are important to your business, you might want to try this out and see if you can learn some good tidbits about how placement affects your conversion. If you have any questions, please leave a comment here…Thanks! Great post. Can only agree. Internal search is for many companies a great oppertunity for optmization that is within control. 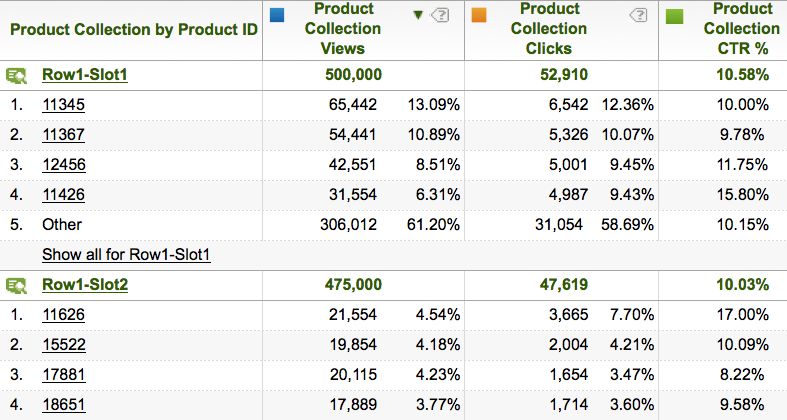 I maid a similar analyse for a big French e-commerce retailer and we found that the firts 8 products of the list page maid 55% of the turnover, in average. Interesting article here Adam – thanks for sharing! Any thoughts on calling this in a Custom Link onClick or using URL Parameters (or a cookie) to pass the internal search placement info to the landing page post-click? Great article, even after 4 years+ 🙂 Thanks, this was just what I’ve been looking for! Hey there – this is a really old post… But I found something out. When using facets, and depending on the browser used, device used and resolution of the screen – it can make this a very dynamic (and hard to digest) report… So product 1 vs product 2 vs product 3 – in that position on row 1 – is affected by a facet or sorting used. So product 3 becomes swapped with product 1 in the placement of the row when using sorting, or rows of 3 slots becomes two slots when a smaller resolution is used (it spans down and will show only 2 products per row- thus putting product 3 in row 2-slot 1)…. Does anybody know how to fix this? How can it take into account facets, filters, browsers, or was this at its entirety for purely telling clicks that products get like activity map? Bc when I look at product 1 it shows about 10 (or more) different positions, unless I remove all facets, put on one resolution, and one type of device and browser and make sure it was on page 1 haha… It got pretty exhausting and was hard to figure out what went wrong. And at the end of it all – it almost feels like I could have just used activity map with link clicks and put that up against page views for internal search impressions and internal search clicks, and just found an alternative way to grab the placement/positioning from a table database… But then again, its not taking into account the facets used and such. I feel like squeezing clicks into one position for one product isn’t accurate or a full view report since its just showing a slice of everything happening in one view… I hope this makes sense.